Approaching the mark on port means having to give way to everybody else on starboard. You have to turn 90 degrees further, which is very bad for boatspeed. Rounding a mark at less than full speed makes you vulnerable to being passed. If somebody tries to squeeze between you and the mark, you can pass them. Overstanding (going beyond the layline) is not optimum sailing, although, if not overdone, the damage is less than some people think. And there are tactical reasons to do it, if warranted. Tacking short of the layline is very bad. When you realize you aren’t going to make it, you’ll either have to pinch or take 2 short tacks which cost several boat lengths to weather and speed at the mark. And you’ll have to do it in heavy traffic. Use Time to the Laylines to determine where the layline is. When heading toward the starboard layline, ‘Stbd Layline’ counts down. When it reaches 0, you’re there. ‘Port Layline’ tells you how long you will be on starboard before you get to the mark. 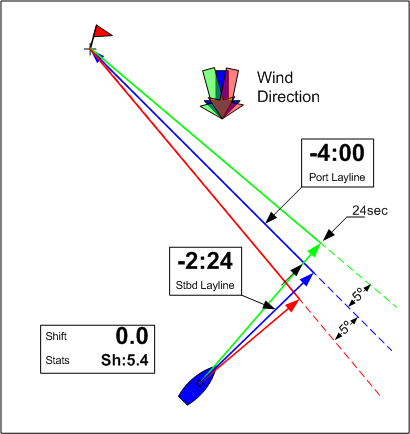 If you hit the layline too far from the mark, wind shifts will move the line and you may be short or overstand. 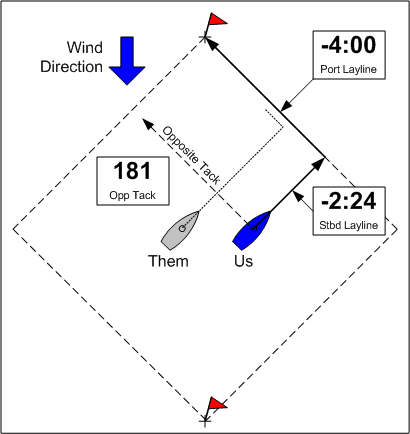 If you hit the layline less than a couple of minutes from the mark, you won’t be able to get up to speed, and the crew won’t have enough time to prepare for rounding. Your close-by enemies to port will have to go behind you or tack short. The ones to starboard can force you into that situation. You should have lateral separation of 5-10 boatlengths from the starboard enemy so you will have clear air on the layline. Sometimes the mark isn’t where it’s supposed to be. You can use Opposite Tack to check whether the layline is where it’s supposed to be.. If Opposite Tack points to the mark when you’re on the layline, things are OK. If it doesn’t, you have a decision to make. Adjust your tack onto the layline depending on expected wind shift. When you tack for the mark, you’re committed. If the wind subsequently shifts, you have a problem (headers being much worse). Be aware of the current shift when you decide to tack. The Shift display shows the current wind direction relative to average. Positive numbers means the wind is right (meaning an evential header), so you should go beyond the layline so you won’t come up short when it happens. Negative numbers means the wind is left (meaning an evential lift), so you might tack short so you’ll be lifted onto the layline when it happens. How much should you spin the intersect? About 2% of the Port Layline reading times the average shift expected over the starboard run to the mark..
Where are you in the shift cycle, and how big a shift can you expect? The Stats display includes a shift item giving the average size of the wind shifts (over the last hour). Overstanding is better than tacking short.